The history of the Chihuahua is steeped in speculation. One theory is that Chihuahuas originated from a dog called the Techichi in the Toltec Civilization near Mexico City around the 5th century BC. The Toltecs, (the people that conquered the ancient Mayans) brought Chihuahuas into their homes as pets and also used them in religious ceremonies to make atonement for sins and be guides for the spirits of the dead. They were sacred icons of the upper class. Chihuahuas were named for the Mexican State Chihuahua that borders Texas, New Mexico, and Arizona. Another theory is that when the explorers arrived in the New World, they bred the Techichi with a small hairless dog that they had brought with them and the resulting breed was the Chihuahua. What we do know is that the dogs were found in the State of Chihuahua, Mexico in the 1850s. 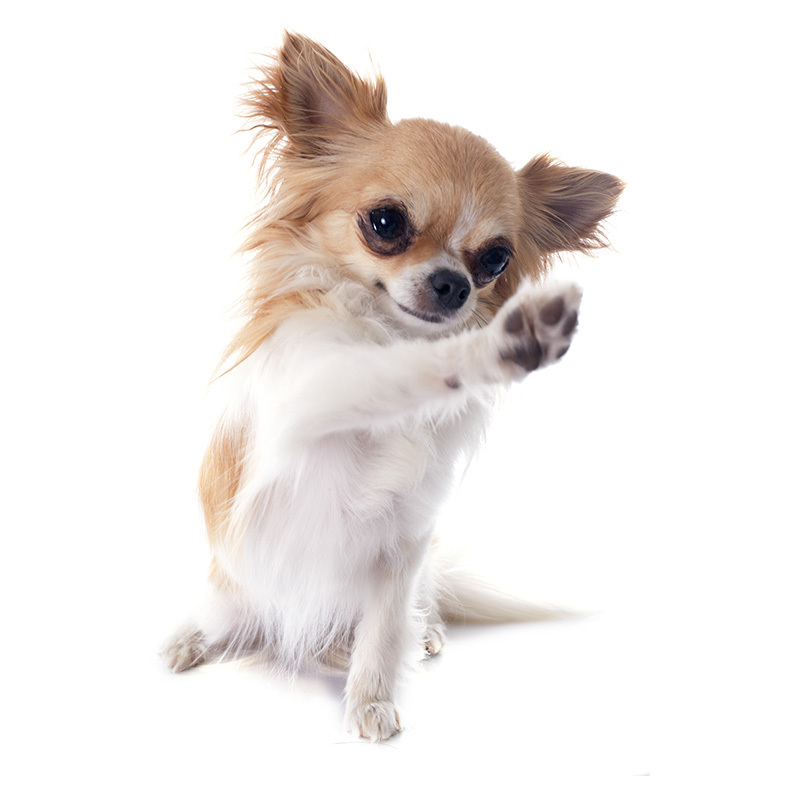 Chihuahuas have a terrier-like personality of being feisty and relentless. They’re very good barkers! Chihuahuas crave physical attention and affection and love to sit by you on the couch snuggled up in a pile of blankets. They tend to bond closely with their primary caregiver. You’ll need to keep a close eye on them with other dogs, as they think they’re the biggest dog around. You will need to teach young children how to properly play with this tiny dog to avoid any unintentional injuries. They’re great watch dogs, as they’ll sound the alarm if someone they don’t know comes in your home. They often shiver when they’re cold, frightened or excited. Chihuahuas are the smallest breed of dog in the world. They usually weigh between 2 to 12 pounds and stand approximately 6 to 9 inches tall. Chihuahuas are known for their beautiful large erect ears. There are two types of Chihuahuas, the apple-shaped head and the deer head. They also come in two coat types, short hair and long hair. Interestingly enough, the long-haired type actually sheds less than the shorthaired type. They require little care. Chihuahuas rank 5th in popularity with America's Pet Registry Inc. Sales for Chihuahuas rose dramatically after the Taco Bell dog commercial was aired. The dog’s name was Gidget, and she would say the popular catchphrase, "Yo quiero Taco Bell,” which means “I want Taco Bell.” They are said to have the largest brain of any dog relative to its body size. Chihuahuas prefer the company of their own breed to any other breed of dog.